For anyone wishing to link to pics or albums on Flickr, the following instructions should work. There seems to be two ways of doing it. If anyone can come up with a simpler method, I'm all ears! Click a photo on Flickr to open it. Click on the size you want to see - Medium 800 seems about right here. Select Copy Image Location or Copy Image URL (text may vary per browser). In the forum reply box, click on the 'Image' button to the left of the camera symbol in the top row and paste the URL in the box. Click on the box containing the Latin text and the picture should appear. Click the OK button and the picture will be embedded in your post. 'Embedding an album, photo or video' Follow the instructions in this section to post an album, using the blue 'Embed Media' button in the second row, next to the Youtube button. Select the Album you wish to post from the Album List page. 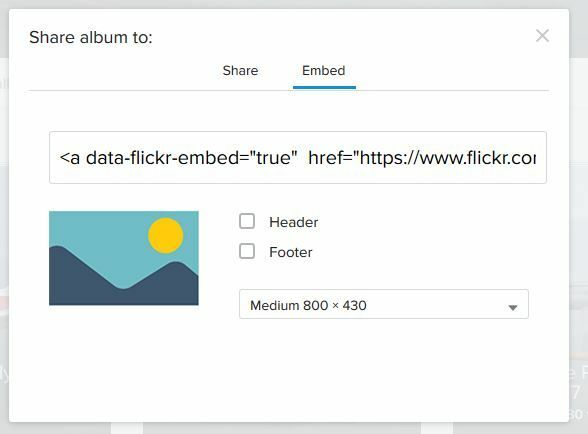 Click Embed in the box which is displayed (see example below). Pick a size you want to display - 800 x 563 seems about right here. Copy the code by clicking on it (it will be highlighted in blue), then click the X. In the forum reply box, click on the blue 'Embed Media' button in the second row and paste the code in the box. Click OK and the album will be embedded in your post. Just tried the second method above, comparing it to what I previously did - and had mentioned on page 10 in the sandbox. Works fine and has the advantage (I think...) that when you hover over the picture some flickr links become active and clicking on the image takes you straight to the flickr album containing the image. I'll try to remember the new way!